I've seen (and done) several trainings and presentations on the power of using Google Forms for rubrics, quizzes, and other assessment, but how to get said Forms to your STUDENTS is an important aspect of the workflow that often gets overlooked or de-emphasized in the course of the training. You can have the greatest Google form/survey in the world, but if you cannot get it yo your audience/students, the form is worthless. 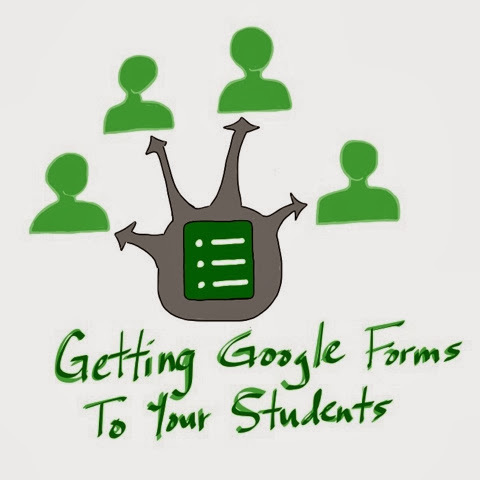 When you're using Forms within your Google Apps domain (with other teachers/staff at your school/district), it can be as simple as emailing the live form to everyone on that domain, but the access gets more complicated when students will be using their own Google accounts (or none at all). The solution you choose to send your students your Google Forms will mostly depend on your set-up, but most often you'll have several of these at your disposal. 1. Set up an contact group with your students' Google accounts for each class (done in Gmail or Contacts). Compose an email to the classes you want to submit responses (type the name of that class in the address field) and link to the live form or embed the form in the email with HTML. 3. Take the link to the live form and shorten it with a service like bit.ly or tinyurl.com. Put the shortened link on your white/chalk/SMART/Promethean board or projector. 1. Set up an contact group with your students' Google accounts for each class (done in Gmail or Contacts). You'll need to ask them for their Google account first. Some may need to set up accounts. Compose an email to the classes you want to submit responses (type the name of that class in the address field) and link to the live form or embed the form in the email with HTML. I advise against any solution where you email the link to the STUDENTS because I think you lose more time than on a tower/notebook waiting for students to login to email. 1. Create a doc with a link to the live form and put the doc in shared folder on Drive accessible by the default account for your cart. 2. Take the link to the live form and shorten it with a service like bit.ly or tinyurl.com. Put the shortened link on your white/chalk/SMART/Promethean board or projector. 1. Create a doc with a link to the live form and put the doc in shared folder on Drive accessible by all the students in your class. You'll need to share the folder with their personal Google accounts. I have an iPad cart in my room from which students access Drive from a shared account, and I will often use several of these options for one Form. Which solution is best for me usually depends on if I want students to have access to the form from home (on their own accounts) or if we'll just be using it in class). My best advice is to not fall in love with any ONE application. Don't Give Up on Manipulatives!